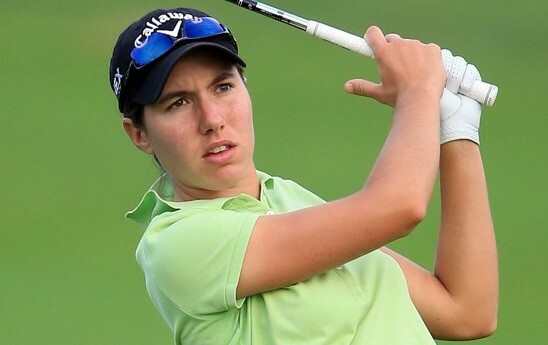 Spain’s Carlota Ciganda broke the World Ladies Championship tournament record by shooting a nine-under-par 63 in round two at Mission Hills Haikou in tropical Hainan, southern China on Friday. A career low round catapulted the 22-year-old from Pamplona from a share of 26th place after the first round into second, one stroke short of World No.4 Inbee Park from Korea. Ciganda fired nine birdies on the Sandbelt Trails course on an afternoon of blazing sunshine on Friday, with four on the front nine and five on the back, including two under pressure on the last two holes. Ciganda, who claimed her second Ladies European Tour victory at the Suzhou Taihu Open in China in October, before going on to win the tour’s Rolex Rookie of the Year award and ISPS Handa Order of Merit, said she felt at home in China. "I feel very comfortable. I like the way they treat us and the course is very nice so I feel very calm, very relaxed. It’s one of my favourite places because I played well last year and it seems like I’m playing well this year so hopefully I can play good over the weekend and be at the top,” she said. South Korea leads both the Team and Individual Competitions taking place concurrently over 72 holes of stroke play, largely due to Park’s amazing 36-hole total of 11 under par. The 24-year-old from Seoul fired seven birdies in a flawless 65. Meanwhile in the Team Competition, the combination of Park and Ha Neul Kim gave the country a staggering seven shot lead at -14 under, over Spain, represented by Ciganda and Tania Elosegui and the Norwegian pair of Suzann Pettersen and Marianne Skarpnord. Pettersen ended the day in a share of third at seven under par alongside Italian Veronica Zorzi and South Korea’s Bo Mi Suh, who still had two holes to go when play was suspended for the day due to darkness at 6.40pm local time. The start of the second round was delayed by an hour and 50 minutes due to fog on Friday morning, meaning that six groups are due to finish their second rounds on Saturday. There will be a shotgun re-start commencing at 7.30am on Saturday, before the cut to the leading 50 professional golfers and those tied for 50th place. In the team event, each country is represented by two players and the result will be determined by the lowest aggregate score. If a player misses the cut in the individual event, she must play the remaining two rounds to be eligible for the team prize fund. There are 19 teams representing 18 different countries, with two teams from China… and the stage is set for an exciting weekend.